This is Jaime calling again to let you know we had a very nice hike up Rucu Pichincha today (15,696 feet / 4,784 m ). A landslide made it inconvenient to get to Guagua Pichincha, which we climb more often, so we came to Rucu and had a great day. It's right above Quito, and the views down into the city are pretty and you get a great perspective on how the city is laid out and its relationship to the terrain features of the area. There is a cable car part way up the mountain, and we used that to get from about 9185 feet (2800 m) to 13,125 (4000 m.). From there the ascent to the top was about 2750 feet (840 m). My three climbing companions are strong and they are acclimatizing well, so it only took us three hours to get to the top. That's pretty fast at this altitude! 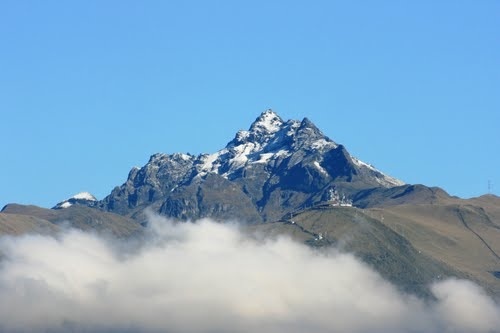 There were clouds on the high peaks so we didn't see them clearly, but the views of the surrounding countryside and down into Quito were excellent. We had lunch on top. It was a little cool but not windy, so it was nice being there for a while. In the afternoon we drove north to the countryside flanking our first big climbing goal, Cayambe. We drove to the beautiful hacienda called Guachala. It has good food and nice old architecture, and I think everyone is happy to be here. On Wednesday we will drive to the hut on Cayambe. We will get out of the vehicle and walk for the last hour for continued acclimatization, but the vehicle will haul all our food and gear to the hut. It will be another fun day. OK. That's the news for now!"